This grey and black scheme, with plenty of chrome and a marble breakfast table, makes for striking look with plenty of cool lighting to match! 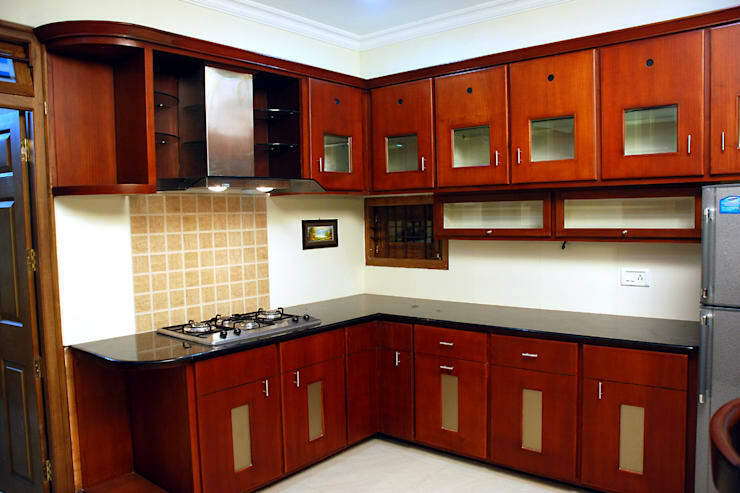 Done up with lots of wood and granite, this solid L-shaped kitchen is one of the most convenient kitchen styles. It looks good with these complementary materials. 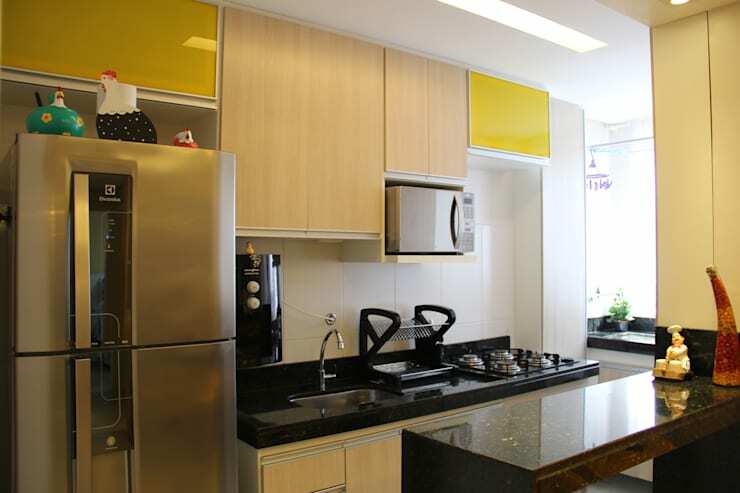 This yellow and pale wood-based kitchen is a mellow addition to any small home that is short on space. 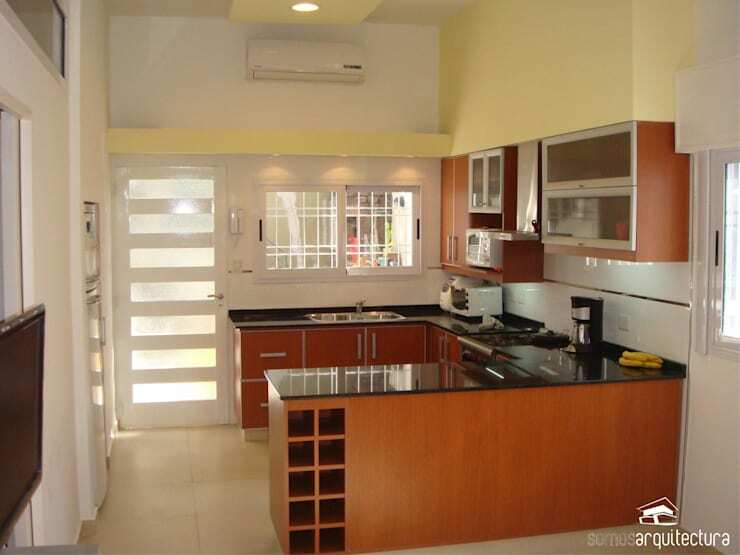 This scheme visually opens up the room, while the white cabinets create an uncluttered feel. The rest of the space has plenty of highs and lows to fit in all the appliances. 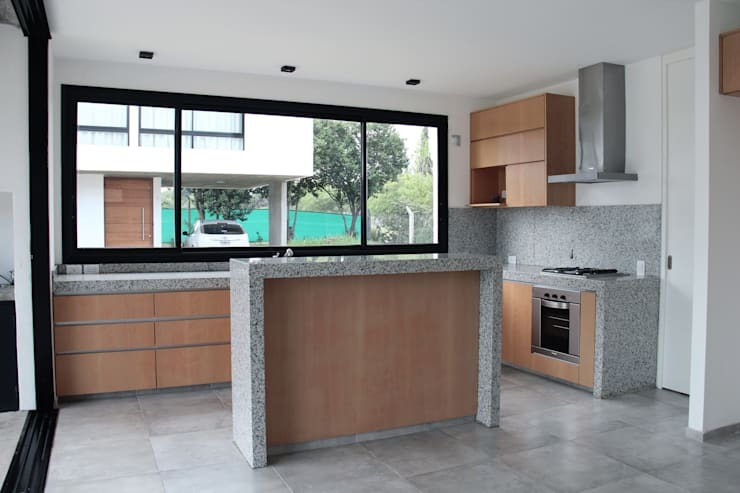 This soothing kitchen was designed by the architects at Donakaza. The soothing vibe of this kitchen is due to the wooden and grey elements that come together on a white canvas to create some soft magic. The recessed wooden features, especially in the main island, make for a well-contoured and linear look in this space. The U-shaped kitchen is perfect if you have a little space to spare, as it gives you three working counters along with your bank of appliances on one wall. The counters have been kept low to allow for a more fluid design and open vibe. This kitchen neatly fits into a corner that has been pushed back to create an extra sliver of space. With a defining element like mahogany wooden textures, it truly stands out. The beige and white backsplash makes for a simple yet stylish contrast. 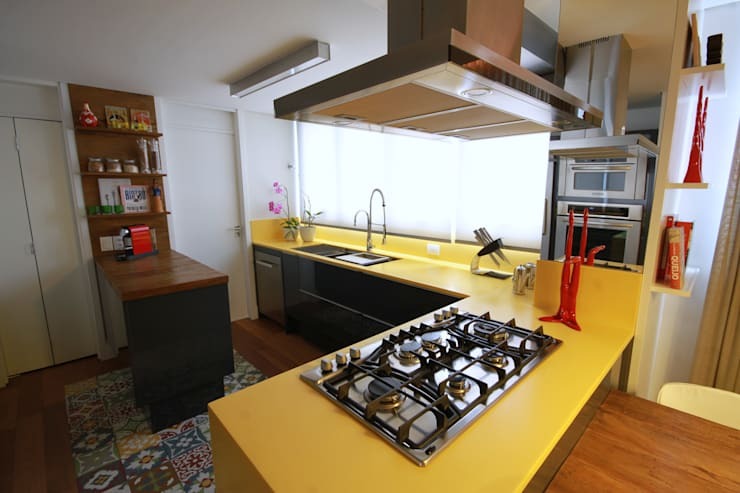 This kitchen is a bright one with its cool yellow counter and gleaming chrome fittings. The shelf on one side and the red accessories add some necessary pops of colour to make it even more vibrant! 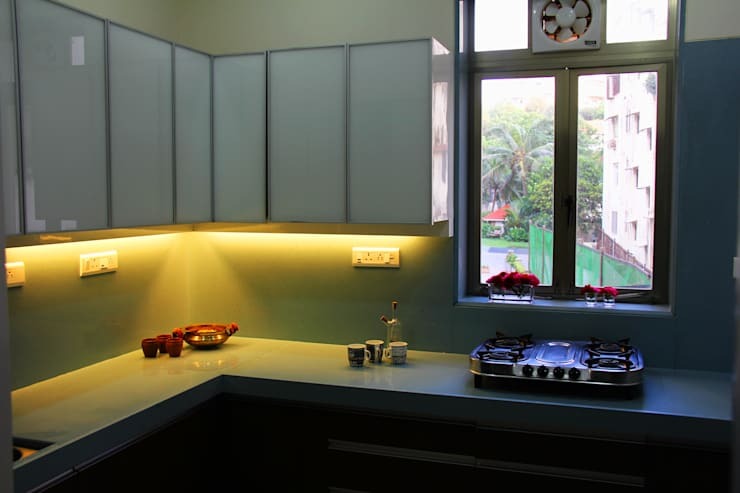 This kitchen has some sharp illumination to highlight the textures of the space, as well as its workspaces and counters. 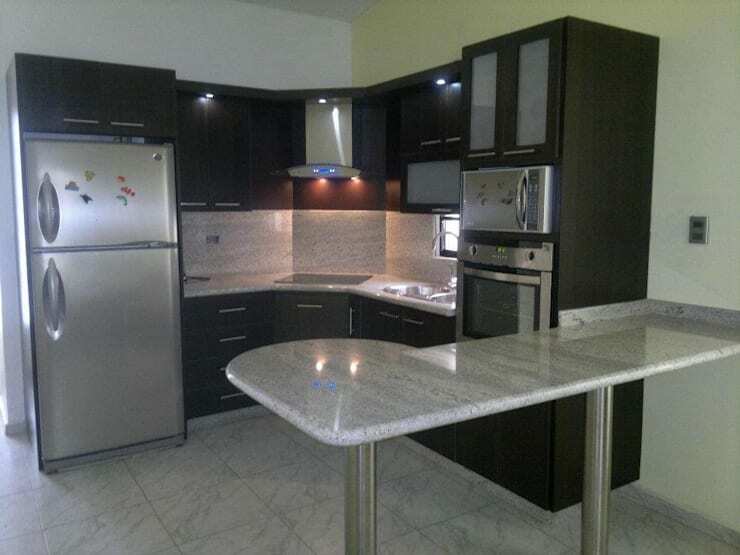 The simple cabinets are in plain tones to help balance the dramatic lighting effect. 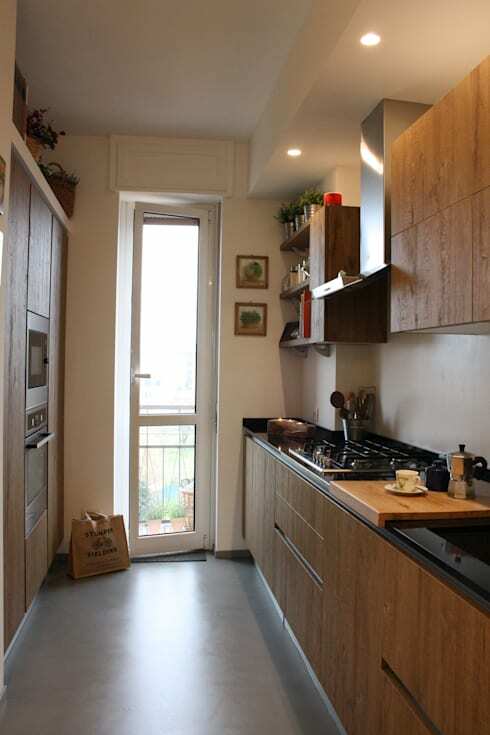 This galley-style kitchen fits well into its narrow space, with a door opening onto the terrace or balcony behind. 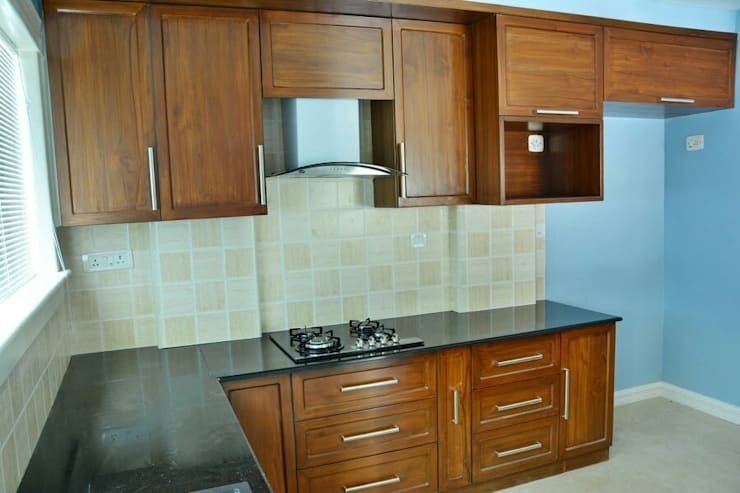 The wooden details of this kitchen, along with its chrome appliances and black granite counters, make for a sleek yet homely design. 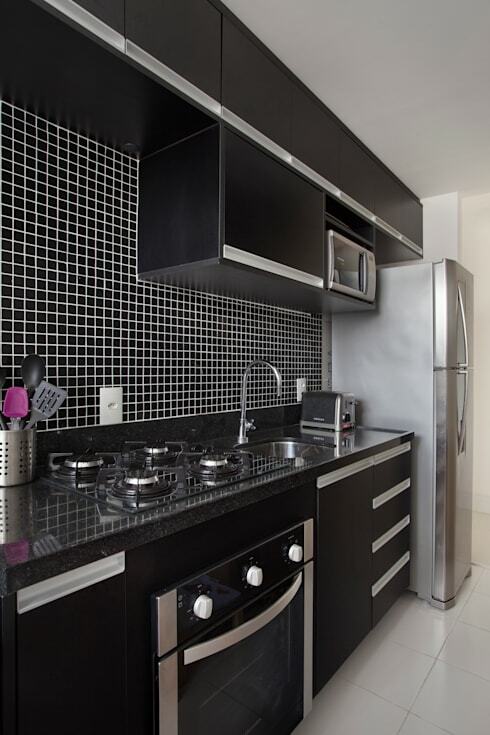 The retro tiles in this monochrome kitchen make for a rather dramatic look, while black cabinets add to the appeal. The floors have been kept white so as to balance the aesthetic. Hungry for more kitchens? Check out 12 ideas for a small and modern kitchen. Which of these kitchens is your favourite?